Pizarea has a chat system that enables clients to chat with a 24/7 online support both on the application and the website. There is also a customer service representative always happy and ready to assist with any challenge faced while ordering and provide the needed information on restaurant’s opening and closing times, menu, specialties, delivery charges and reservations. In addition, Pizarea allows you to make payments online via MPower (Mobile money), VISA, Slydepay, and Payza. Moreover, orders can be placed and paid for loved ones in Ghana by People abroad via World Remit. 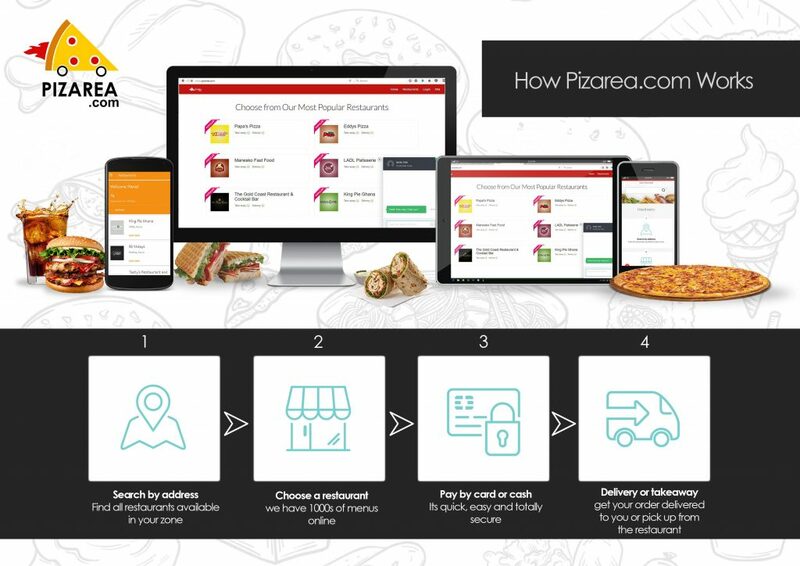 Pizarea is so flexible that it allows you to order food online in Ghana and abroad. Customers notwithstanding, can pay cash on delivery or cash on pick-up in order to skip long queues at favourite restaurants. Pizarea has an efficient delivery system that enables customers to track their orders via a link provided when the order is verified. Orders placed are received in 45 minutes or less. Delivery covers the whole of Accra and Tema, and orders are delivered at the comfort of your offices, homes, and convenient location you prefer. Pizarea is so flexible that it can be done off the back of a bus and even in a plane. So for online shopping of food, Order food online in Ghana using Pizarea.